If you are looking for an executive style home, in a gated community, with beautiful ocean views, plus pool, large lot and cul de sac location, within walking distance to award winning schools, this home is for you. Offering 5 bedrooms, plus office and loft, 4 full bathrooms and powder room. See supplement for all upgrades. Flowing floor plan, open and spacious with lots of natural light, ocean views from much of the home, deck off master, total entertainers yard, pool, hot tub, waterfall, BBQ......., Executive style home with all the amenities you would expect. Expansive kitchen with plenty of work space, Thermador 6 burner plus griddle, e-granite sinks, including sink on the island, built in Viking refrigerator, stainless steel dishwasher. Nook area resplendent with ocean views, recently installed designer chandelier, tile floors, large family room with cozy fireplace, open concept to living room, crown moulding in living room, beautiful contemporary ceiling fans in living and family and master bedroom. Office which could be an optional bedroom, plus additional full bedroom and bathroom downstairs, perfect for visitors, staff, or the elderly. Upstairs boats a large loft, has possibility to serve as a home gym, play room, tv area, or maybe a bedroom?? Full bedroom with en suite bathroom, plus additional 2 more bedrooms with Jack n Jill bathroom located upstairs, all with walk in closets, two have ocean views, plus spacious master bedroom, deck off master, plus retreat, shown as yoga room, again ocean views, plus expansive master bathroom, soaking tub, walk in shower, duel vanities,walk in closet. Enter the home and be delighted with a Japanese inspired serene courtyard. The rear yard is simply wonderful. Custom salt water heated pool, hot tub with cascading water fall, all share ocean views as could you sipping a cold beverage. A large side yard houses the built in BBQ, fridge, sink and fire pit plus citrus trees, plus outdoor very decadent heated shower. Turf covers part of the garden, low maintenance, plus lovely paved seating area. No neighbor behind which makes for great privacy. 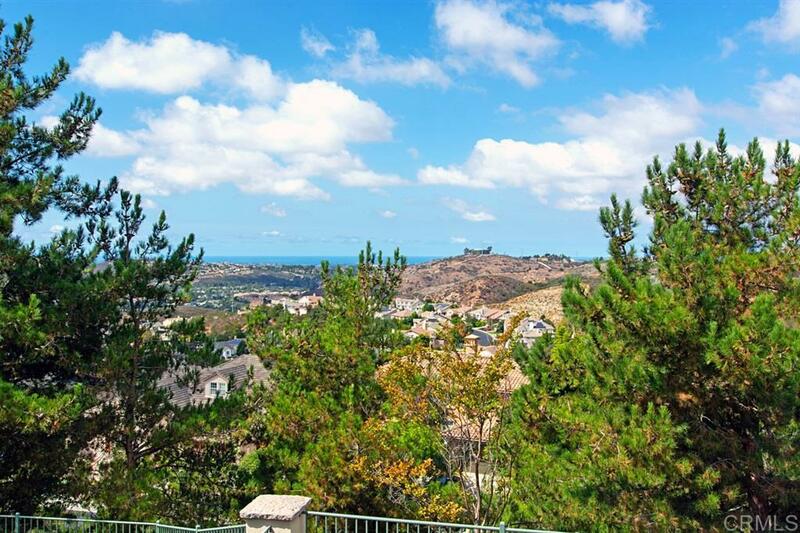 Located in a cul de sac, within walking distance to award winning schools, plenty of walkable restaurants, cafes, stores, not to mention the miles of trails beautiful San Elijo Hills has to offer. A great place to call home.